If you're serious about treasure hunting and want a detector that can give you extreme depth and high end performance then the DRS Ground Exper is the machine for you. It comes with three coils for all your detecting needs. The 40" coil should give you 30+ foot of depth. New updates are in the works to fix the few little issues I had with the unit, which includes bluetooth to eliminate the cable connecting the machine to the tablet. Besides extreme depth the ground exper offers easy ground balance and better discrimination than any other machine out there. DRS also makes other pulse induction detectors for those who don't need extreme performance. 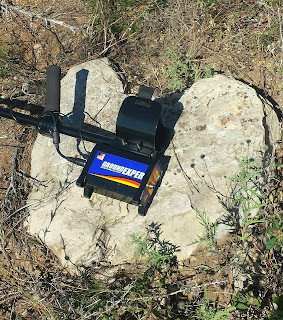 Whether you are coinshooting, nugget hunting, or searching for an outlaw cache DRS makes a machine for you. Take the time to check out drselectronicsusa.com and if you mention Okie sent you you will get free shipping on the FXII and FX3000 or something useful for the Ground Exper. In May of this year my Grandmother Juanita passed away. Her husband Don was kind enough to give me a metal detector she had used for decades. As a small kid she would let me play with her detectors and read her Oklahoma Treasures and Treasure Tales book. 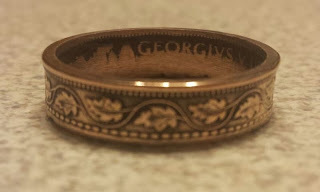 This of course planted the seed for my love of treasure hunting. Not surprisingly the old Sears metal detector, made by White's Electronics, still works. It didn't even need a new battery. It wasn't until 1992 that I bought my first new metal detector. It was a White's Spectrum Eagle and I must have been the only person on the island I was living on at the time, because I found so many coins that I was almost sick of digging holes. Years later, in a moment of weakness, when I thought I needed a newer model, I sold the Spectrum to my aunt. I have regretted it ever since and she won't sell it back. I guess she knows a good thing when she gets it. Just for kicks I took grandma's old Sears detector out and did a little coin shooting. The old machine doesn't have a lot of bells and whistles and depth was shallow, but it still pulled some change out of the ground. The dirty, old, beat up and battered detector now hangs in a place of honor among the newer and much more expensive machines. No matter how much technology advances this will always be my favorite machine. It was, and still is, part of my life. Just like my grandma has been. 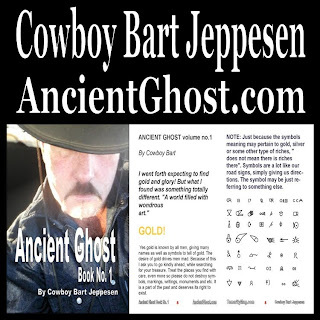 If you are looking for something new to read concerning treasure hunting, my facebook friend Bart Jeppesen has just the thing for you. 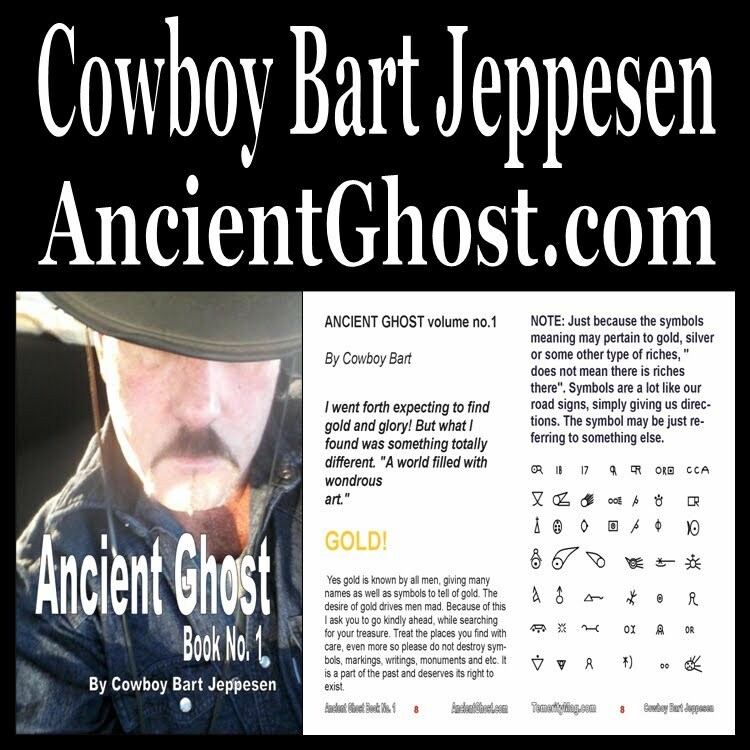 He has written a five volume series that is loaded with treasure signs and symbols. 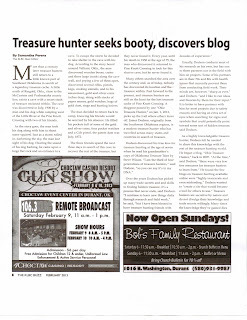 While our treasure hunting styles may differ, I always enjoy reading about what others find out in the field. Bart has included explanations of symbols and plenty of photos. I've read the first volume and look forward to delving into the next four in the series. Add these books to your library and compare what he has found to your own experiences out in the field! Recently I was invited to the hill country of south Texas to participate in a screen dig for artifacts. This is a controversial topic when it comes to artifact hunting. I can see both sides of argument. 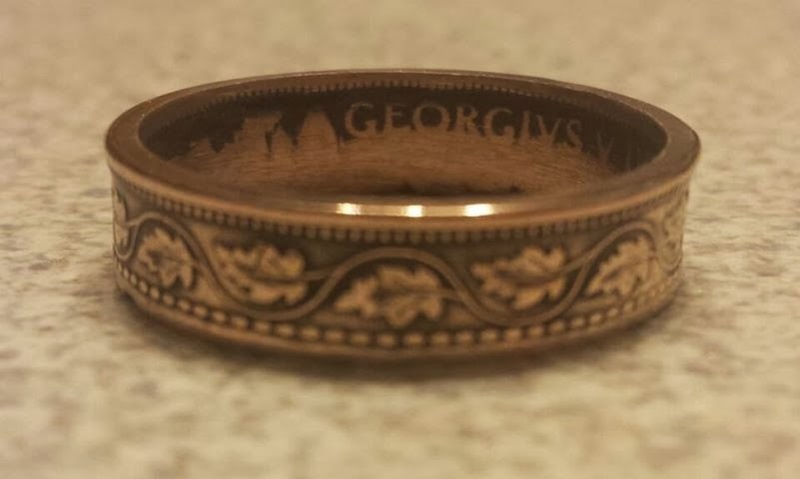 There is a loss of archeological information, but on the other hand it is legal in Texas to dig on private land and what is found ends up being displayed in private collections instead of hidden away in museum storage. 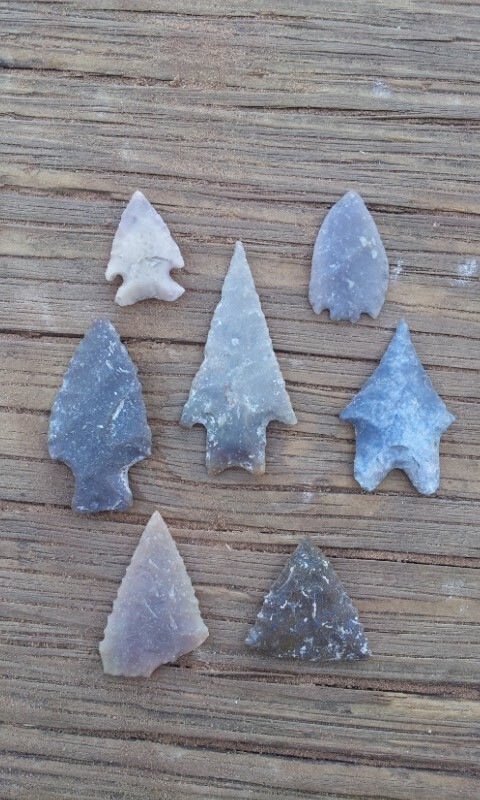 In Oklahoma digging for artifacts is illegal, so we are limited to surface hunting. I decided to make the trip since this would be a new experience for me and one of the last digs that would take place on the site we were going to. We started our eight hour trip early in the morning so that we would have enough daylight to do some surface hunting once we made it to Barksdale. The trip down was filled with stories of finding points and a few treasure stories thrown in for good measure. I was prepared to camp out, but we decided to get a hotel room instead. While the room was clean and comfortable it was little more than a place to sleep. No phone, tv, wi-fi, or shower in my room. Just a tub that thankfully had hot water. Early the next morning we we headed to the next town over for a quick breakfast. We were planning on surface hunting during the lunch break instead of eating, so I ordered a big breakfast of pancakes, bacon, eggs, toast, and hashbrowns. After stuffing my face we made the quick trip over to the dig site to unload our gear and claim our screen. South Texas hill country has a rugged beauty all its own and the dig site was located beside the Nueces River. It would be a great place to build a vacation house but the $800,000+ price tag for the 100 acres seemed a bit steep for my wallet. Nacho arrived with the skid loader and shortly after unloading it the fun began. I'm not sure what I was expecting, but once that first load of dirt hit my table I became aware that it was going to be a long day of hard work. You are constantly sifting dirt off the screen table in an effort to move through as many loads of dirt as possible. My first find was a thin flake that had been worked into a point. Beginners luck was definitely working on my behalf. While it was slow going for those working around me, I was pulling some nice points out of my dirt. I had a nice variety of points collecting inside the protective case I brought along to put my points in. Four hours later we stopped for lunch and a walk up the hill to surface hunt didn't seem like as good an idea as it was the night before. 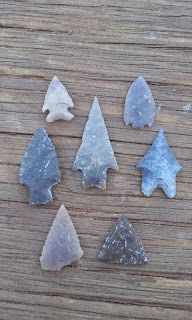 I made the decision to stay behind and clean up a few of the points I had found since there wasn't time to take a good look at them during the dig time. The quality of workmanship on some of the points was amazing. The rootbeer flint that is common to the area makes for translucent points. Lunch was over and we went back at it. The area has been heavily dug so the last couple of hours provided very few points. Our dig time was soon over and I have to confess that I was ready to call it quits a bucket or two of dirt before that. I went down to the river to wash a few pounds of dirt off of my face. We knew that we had a long drive ahead of us and darkness was closing in, so we loaded up and headed out. Other than a stop for some good bbq and gas it was an uneventful trip back home. I have to thank Brad, Jake, and Mike for inviting me along. They were good company and I did learn a few things. It was really neat to look at the cuts in the earth and see the different layers of campsites that have been used over and over again for thousands of years. 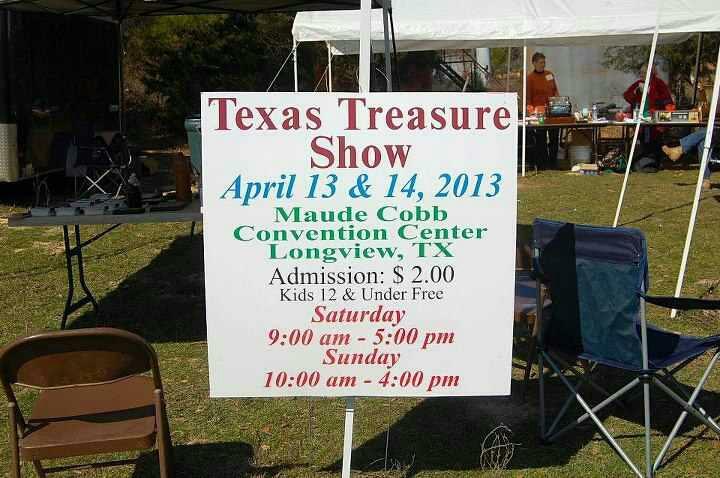 If you are interested in screen digging in Texas there are a few people operating pay sites. Nacho treated us good, but do your own research and decide if this type of hunting is for you. A special thanks to Samantha Perera. It's with great sorrow that I tell of the passing of a friend and fellow treasure hunter, Larry Don Armstrong. Larry was a regular at our annual treasure hunter get together and stayed in contact through email. I could always count on him forwarding something interesting to my inbox. My thoughts and prayers are with his family. Larry will be greatly missed. 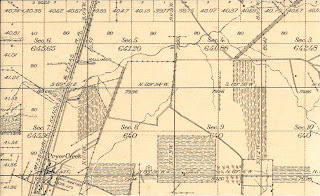 Sanborn maps can be a valuable tool for cache hunters, coin shooters, and privy diggers. 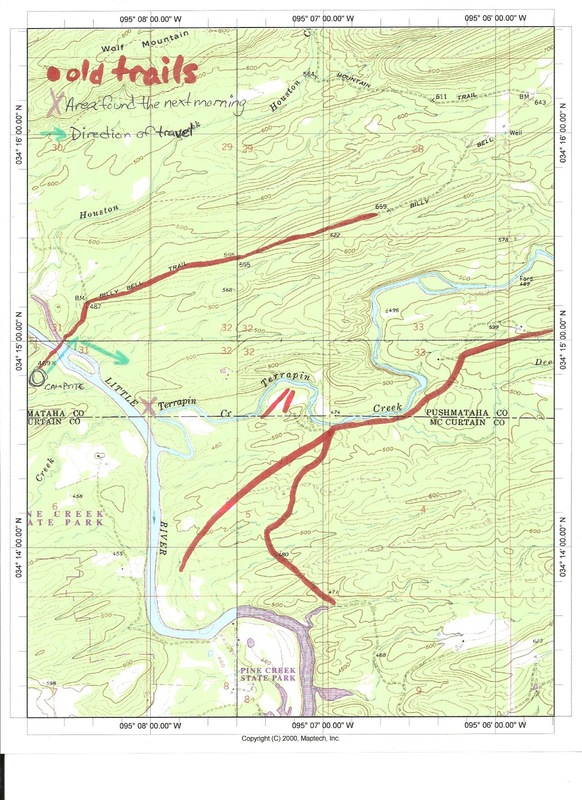 While most sites charge for these maps there are a few that you can get for free. You may also check with your local library to see if they may have a subscription to one of the pay sites so that you can access it for free. While many of us are aware that the current administration is busy working to take away our second amendment rights, few are aware that the EPA and BLM are working hard to strip away your right to gold prospect and treasure hunt. 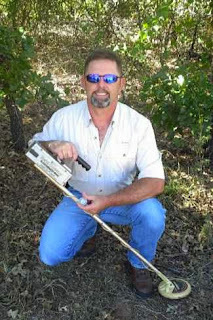 Daily battles are being being fought at the state level to preserve the simple hobby of metal detecting as well. While the NRA is a well organized and funded lobby group with a media presence, we treasure hunters have a voice crying in the wilderness as well. WWATS is hard at work fighting for our rights to pursue the activities we enjoy. Wayne "NuggetBrain" Peterson is the new president and has taken an active roll in amping up the efforts in the fight that WWATS is engaged in on our behalf. Please take a look at their website http://www.wwats.org/ and find a way to help in any manner that you can. This book should be required reading for the beginning treasure hunter or the seasoned veteran. Long overdue in the field of metal detecting and treasure hunting. It's refreshingly straight forward and politically incorrect. I would have recommended it just for the chapter dealing with the KGC alone, but this book has so much more to offer. I actually have mixed feelings about reviewing this book. 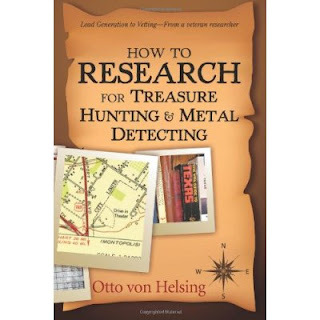 The author has revealed many of the research links and methods that I have held as closely guarded secrets for my own research over the years, but the purpose of this blog is to be a tool for other treasure hunters and this is one tool you shouldn't be without. 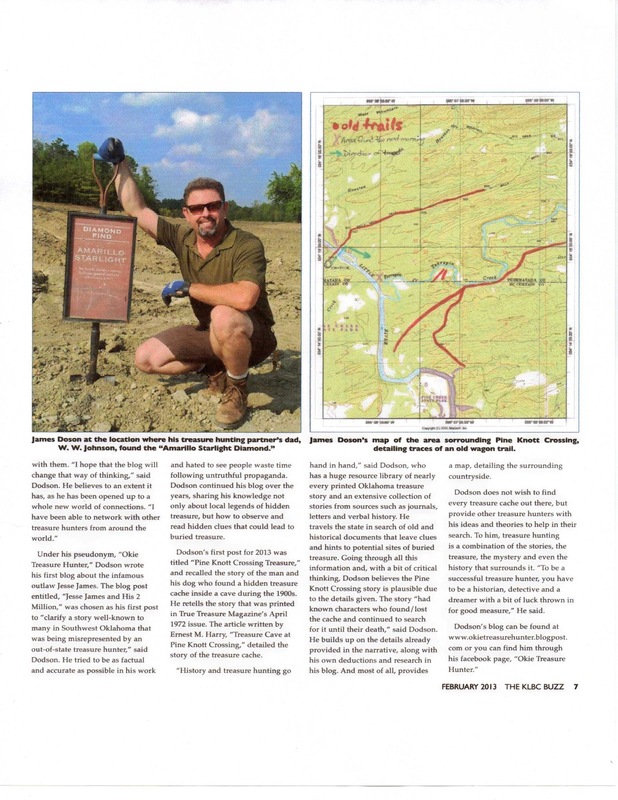 Near the site of the Pryor Creek Creek water tank on the Missouri, Kansas, & Texas Railroad lies a $135,000 cache hidden by the Meadows Gang. The gang had accumulated the approximately four hundred pounds of gold and silver coins from several hold ups they had pulled in the area. While resting near the water tank they decided to bury the cumbersome load for safe keeping. Shortly after this this the gang was captured with several gang members turning states evidence against Meadows, who ended up serving 18 years in prison. 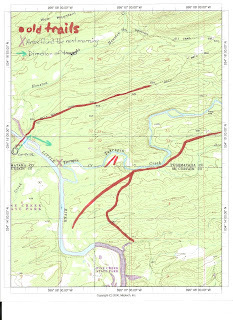 After his release he came back to the Pryor area searching for his hidden loot but there was a lot of area around the tank and the area had changed during his nearly two decade prison term. Meadows was sure the money was still there but had sunken to bedrock in the soft soil. 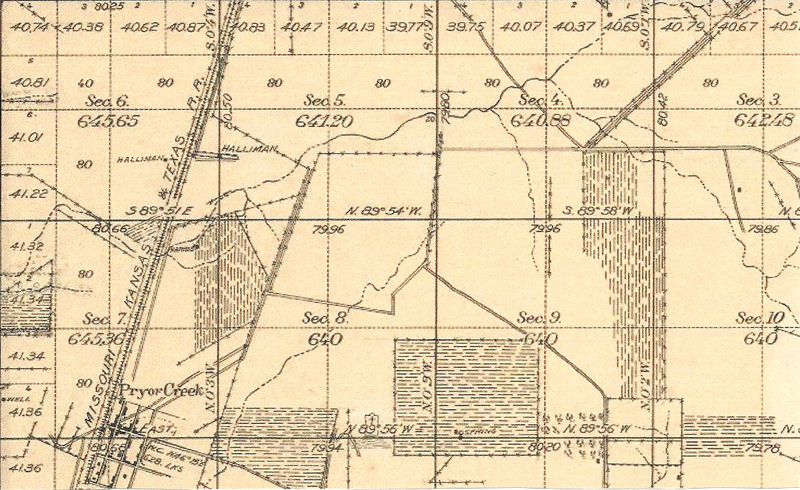 A search of old MK&T RR maps may show the location of the water tank or a trip to the county courthouse to research what records they may have. With todays pulse induction detectors and other equipment this is one that someone with time and energycan recover and with todays gold and silver prices would be well worth the effort.